With pancake flat landscapes and fields of vibrant coloured flowers, The Netherlands is undeniably the bike’s spiritual home. It is a county blessed with over 30,000km of cycle paths, signposted cycle routes and cities designed around 2 wheeled travel. Cycling in Holland is a way of life. Join the Dutch, grab some wheels and explore. From the Green Heart of Holland to it’s cafe culture cities, Holland will provide you with safe, enjoyable and flat cycling. Come and experience the Dutch state of relaxation, or gezelligheid as the locals call it. 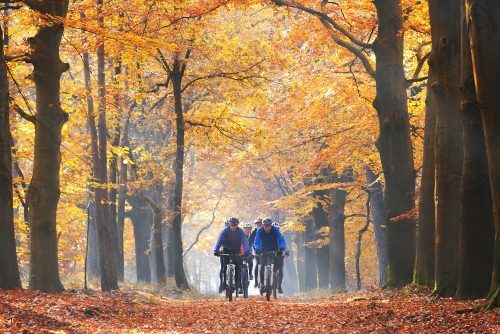 A group of 6 friends cycling through the Dutch forest in the morning fog in Autumn. The country's diverse scenery offers all kinds of riding experiences. 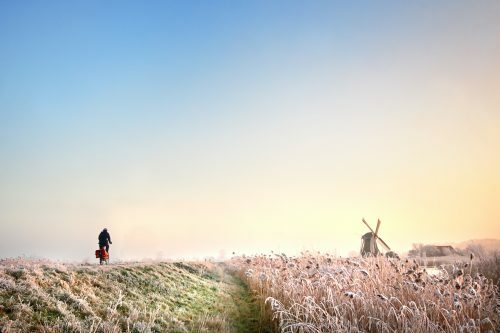 A cyclist riding through the Dutch countryside in winter. The early mornings create a still, motionless landscape and a serene riding experience. The flat, dedicated cycle lanes in Holland make it an ideal place to spend a family cycling holiday. 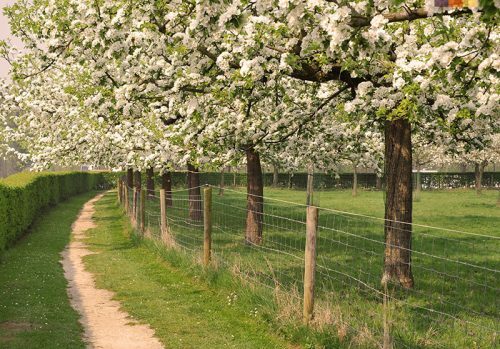 Parents and children of all ages will be able to enjoy the picturesque Dutch countryside and, with our flexible holidays, we can either plan to extend or shorten your routes depending on the preferences of your family. 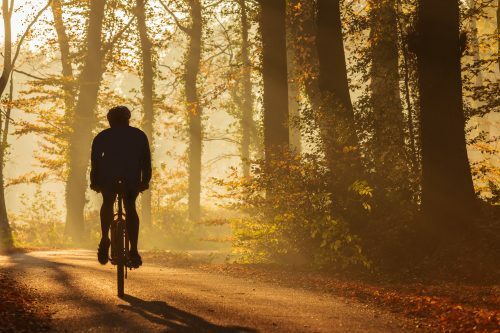 Holland is often recommended as the perfect first cycling holiday and, as such, we would love to organise you a trip here if you’re new to cycling or just want to enjoy some relaxing riding between picturesque towns and vibrant countryside. 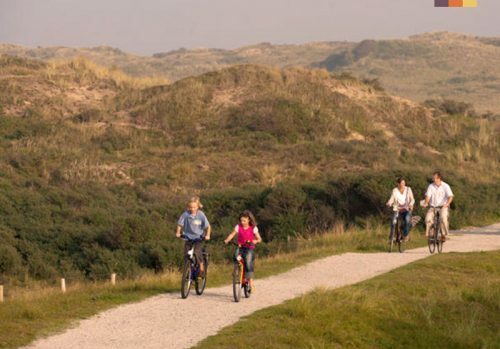 All of our Holland cycling holidays are suitable for families so head over to our Holland itineraries page to explore each trip in more detail. 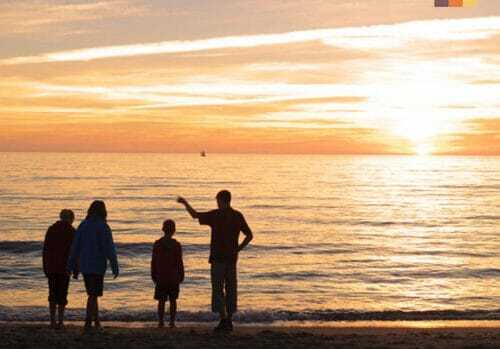 However, we are quick to recommend the Family Cycling Holiday Through Holland trip as this is the most suited to the needs of a family. With an average of just 30km per day, the 6 day trip (which can be extended if you choose) takes you on a loop of The Hague, through the incredible Tulip Fields, along the beach and to multiple historic and charming towns. The whole family will love the amount of freedom and adventure this holiday offers. 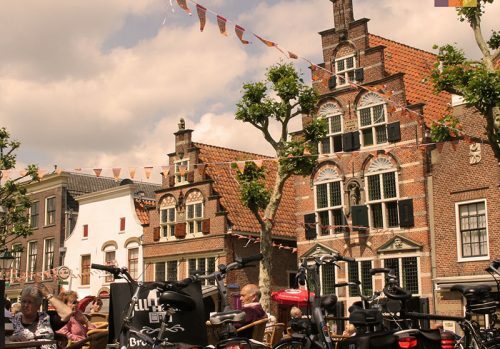 Holland is a great place to travel if you're looking for a low budget cycling holiday. 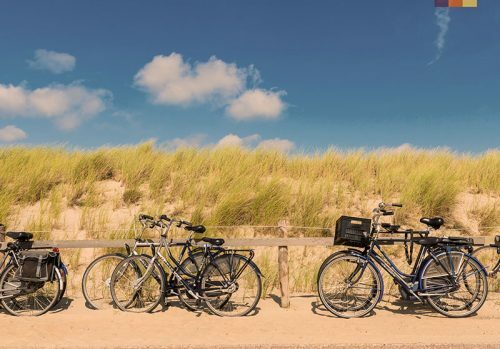 The contacts we have with suppliers in the Netherlands allows us to offer reduced rates on bike hire, airport transfers, luggage transfers, accommodation and meals, ensuring you get the best holiday possible for the lowest price. Our expertise of the area also means that when you book with Love Velo you can be confident that you will be heading off on a great, all inclusive cycling holiday. Three of our Dutch cycling holidays are offered from less than £400 with a minimum of 5 nights. Two of these, the Green Heartlands of Holland Cycling Holiday and Cycling Across Polders and Lakes, are perfect for all types of riders. 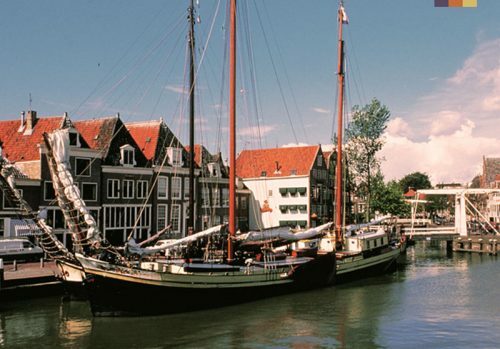 With an average of 45km on the former and 60km on the latter, both trips guide you round the scenic natural landscape of Holland and introduce you to the picturesque towns and cities that make up the heart of Holland. 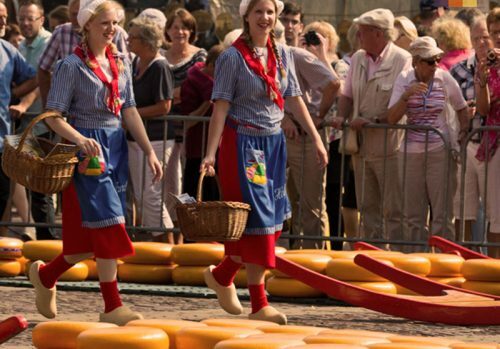 Gouda is one of the trips highlights where you can taste the city's famous cheese. This can be picked up from the traditional market in the city centre. Often seasoned riders will choose to cycle in Spain, France or Mallorca, however few places offer the flat riding that Holland does, making it a unique destination for cyclists seeking this particular terrain. The best trip for experienced riders in Holland begins in Amsterdam. 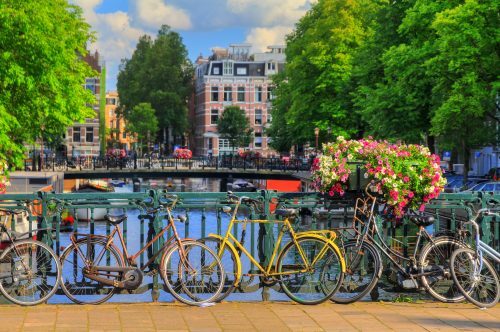 With cycling a huge part of the city’s culture, this is a great place to explore before heading off on your Amsterdam to to Paris Cycling Holiday. This trip, riding at an average of 70km per hour, offers a cultural explosion and an inspiring mix of different lifestyles, architecture, scenery and riding. On predominantly flat terrain, this trip guides you through the Netherlands, Belgium and France, stopping in Gouda, Antwerp, Ghent, Compiegne and many other charming cities and towns. It’s perfect for true explorers and those looking to explore Europe in the most enjoyable way, by bike! In a country also known as 'The Lowlands', it is unlikely that you will travel to Holland to climb mountains! Instead, you'll find that you will fall in love with Holland as a result of the country's vast network of smooth, flat cycle ways. 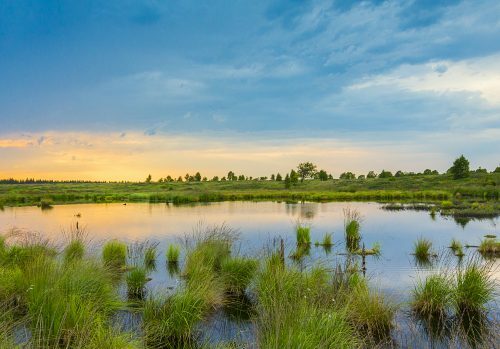 With clear signposts and few cars, Holland is the ideal place for individuals seeking a relaxing ride and stunning scenery. We love all of our Holland cycling holidays due to the unique riding conditions that the country hosts. 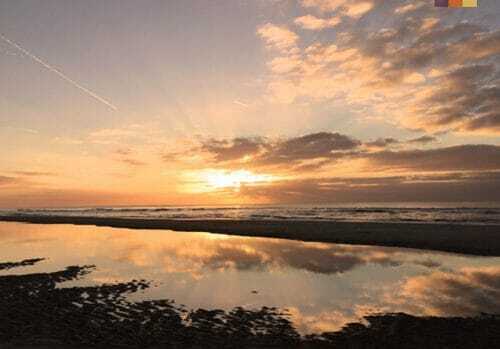 The Sand Dunes and Delta Works Cycling Holiday is ideal for those looking to escape city life and experience the hidden side of Holland and its incredible engineering and architecture. Cycling Across Polders and Lakes offers insight into yet another side of Holland, its stunning rural countryside and traditional windmills, whilst the Holland Cultural Cycling Holiday is perfect for those looking to explore the country's tourist attractions, becoming immersed in the traditional culture along the way. We love starting in Amsterdam and discovering this incredible city before setting off on your cycling trip round the country. The interweaving canals and towering houses aren't found anywhere else in the world so cycling round this city is a must when visiting Holland. 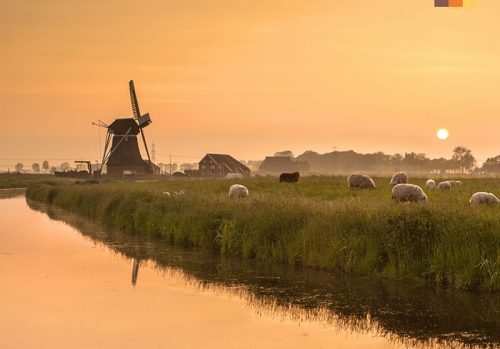 Unique to Holland, the Polders and Lakes provide a stunning a backdrop for a photo. The sweeping countryside dotted with traditional windmills makes for a mysterious, serene landscape. 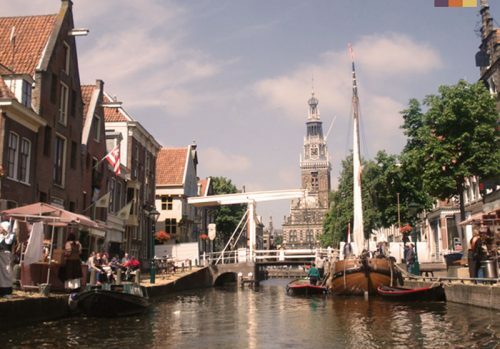 It it’s the lively cities you’re looking for then Amsterdam and Gouda are clear highlights. The historic canals weave in and out of the charming waterside restaurants whilst boats cruise alongside. Take a photo in front of the famous ‘Amsterdam’ sign outside the Rijks Museum to prove you made it but then ride off and explore the city away from the typical tourists spots as this is where the true magic lies. 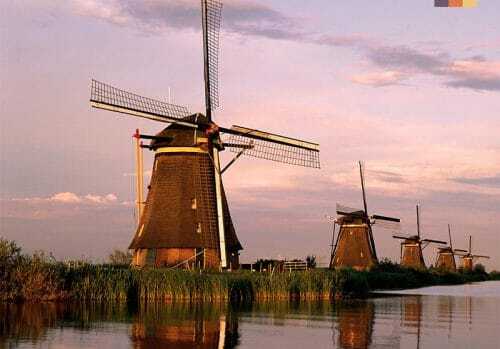 Why Travel to Holland with Love Velo? With our bespoke cycling holidays, Love Velo will provide you with the best all round Holland Cycling experience. Travel to Holland with friends, family or on your own and be assured that we will work with you to make sure the trip fits all your expectations regarding the cycling distance, accomodation, cycling terrain and views. Whether you want to spend long days on the bike or have lots of time to explore Hollands countryside and towns, just let us know. As British Cycling's Official Travel Partners we also offer you a discount on your booking, helping you to save money on your next cycling holiday. We'd love to help plan your trip to Holland, just give us a call on 0207 157 1519 or enquire by emailing info@lovevelo.co.uk today! 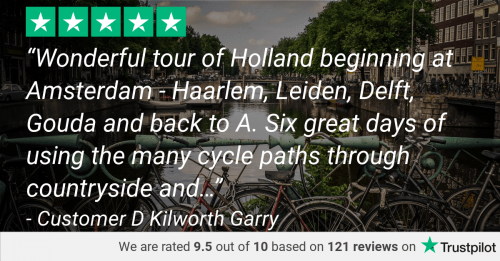 Don't just take our word for it, read our reviews of our Holland Cycling Holidays here!